Our Italian plum tree is loaded, and while we love to eat them right off the tree, I am always looking for a sauce or chutney to put them into. After learning that the most requested recipe from the New York Times has been a plum torte, I continued the search to find one that was gluten free. This is from the gluten free girls blog and the feedback was good, even from those who are not gluten intolerant. That is usually the sign of a winner! Mix brown sugar, flour, cinnamon, ground ginger and candied ginger, together. Add plums and mix well. Place plums, skin side up in an ungreased 9 inch pie pan. Combine sugar, flour, cinnamon, baking powder and salt. Mix well. Stir in egg and mix thoroughly and sprinkle over plum base. Drizzle butter evenly over top of crumb mixture. Bake 30-35 minutes until top is browned. Remove from oven, serve warm. We have been picking apples off the tree and making squash soup with ginger and apples. Those flavors have me thinking about a fall drink, especially first thing in the morning. Place all ingredients in the blender and process. Pour into 2 glasses and garnish with fresh apple slices. This vegetable side dish would be colorful with red sweet pepper or for a little more heat a jalapeno pepper. We have enjoyed fresh summer corn but frozen can be substituted. In a saute pan over medium heat, add butter and olive oil. Add onion and pepper and cook until soft, about 5 minutes. Add corn, chili powder, salt and pepper and saute another 5 minutes. Add lime zest and turn heat to low, cook another 2 minutes. Add basil, stir and let sit another minute. This is similar to a post last year called Chocolate Coconut Pie. One of my friends says their family makes it all the time and has renamed it Truffle Pie. This recipe is even easier, as their is no crust to make. Stephanie recently gave me a book called Great Gluten-Free Vegan Eats by Allyson Kramer. The book shares my interest in gluten free cooking and Stephs vegan life style, I am really interested in trying many of the recipes and sharing some of Stephs and my favorites with you. In a heat safe bowl, mix together orange zest, vanilla extract and chocolate chips. In a small saucepan, bring the coconut milk to a boil and pour over the chocolate chips and whisk until well blended. Pour into 6 individual dishes and chill in the fridge until set, about 3 hours. Note: As I was writing this I was thinking I have to try this with coffee or Kahlua, topped with a chocolate coffee bean. The book also recommends using almond extract in place of orange zest for another flavor. Trader Joe's offers a Roasted Seaweed Snack (Nori) in little squares. It is great in strips on salad, just by itself as a snack or as a little sesame surprise in todays soup. I often use the larger Nori as a substitute for bread and just roll up a "sandwich". Heat butter and olive oil in a pot over medium heat. Add onion and sweet pepper and cook until onion is translucent. Add garlic, mushrooms, Worcestershire sauce, Tamari, lemon juice, salt and pepper, saute. Add stock and cook until vegetables are tender about 10-12 minutes. Put Nori sheets in bottom of each soup bowl and add soup. Garnish with green onion. I recently made a little appetizer shrimp cup with Nori as the base. Place the little sheets in a small muffin pan, and fill with shrimp, sliced avocado, and a dab of mayo. They are packed a little too full but you get the idea. Cold watermelon with salty Feta cheese and fresh mint makes a refreshing summer salad and great along side any BBQ. Cut watermelon into 1 inch cubes and place in a large bowl. Add sweet onion (Walla Walla), Feta cheese, mint and pepper. Toss with reduced Balsamic. Garnish with extra mint and Feta. When time is tight, this and a fresh salad, would make a quick, filling dinner. In a pan over medium heat, saute and crumble the sausage until cooked. Add onions and cook until browned. Add the pasta sauce and simmer until flavors are combined. Slice polenta tube into 3/4 inch slices. Brush each side lightly with olive oil. Place on preheated grill pan and grill about 3-5 minutes on each side until crust appears. Place polenta on a plate and top with sausage pasta sauce. Sprinkle with basil and cheese. Looking for a gluten free cracker option, I was introduced to Sharwood's Indian Puppodums. They can be cooked in the microwave for 30-50 seconds and you have a ready made cracker. Today I served the Puppodum crackers with a light yogurt-cucumber dill dip that also served as a sauce for a cold salmon salad. In a bowl, mix all ingredients together and chill until ready to serve. Top with 1/2 green onion. Fresh picked corn on the cob and grilled on the BBQ is the basis for flavor in this salad. For a vegetarian option, you could leave out the prawns. Brush corn cobs with 1 teaspoon olive oil and grill over medium heat, turning every 30 seconds. Turn off heat and let rest over residual heat for about 5 minutes. In a large bowl, combine corn, black beans, tomatoes, onion, sweet red pepper, avocado and cilantro. In a saute pan, heat 1 teaspoon of butter and 1 teaspoon of olive oil, and chili flakes. Add prawns and cook until pink (about 2 minutes), Add to salad. One of the "mayo's" that I use on sandwiches is Roasted Red Pepper Aioli. I especially love it with grilled chicken hot off the BBQ. The Bake loves it with a side of fries. Today, instead of the usual horseradish-cream sauce for a rib-eye roast sandwich, I used the Roasted Red Pepper Aioli, along with some roasted potatoes for the Bake. In a food processor or blender, process the peppers and garlic until pureed. Add Vegenaise, vinegar, salt and pepper. Process and check for seasonings. With machine running, slowly add olive oil to incorporate. Cover and refrigerate for a couple of hours to allow flavors to meld. I always use fresh crab but in a pinch, canned crab from the pantry will work. Mix the cream cheese, onion, Worcestershire sauce, lemon juice together. Spread in a serving dish. Spread chili sauce over cream cheese. Top with crab meat, and sprinkle with parsley. The apples in our yard are ready to be picked and the local blackberry bushes are ripe and sweet. To make the topping, combine flour, sugars, salt and cinnamon in a medium bowl. Cut in the butter until it is well blended and in pea size crumbles. With your hands work in the oatmeal. Refrigerate until needed. 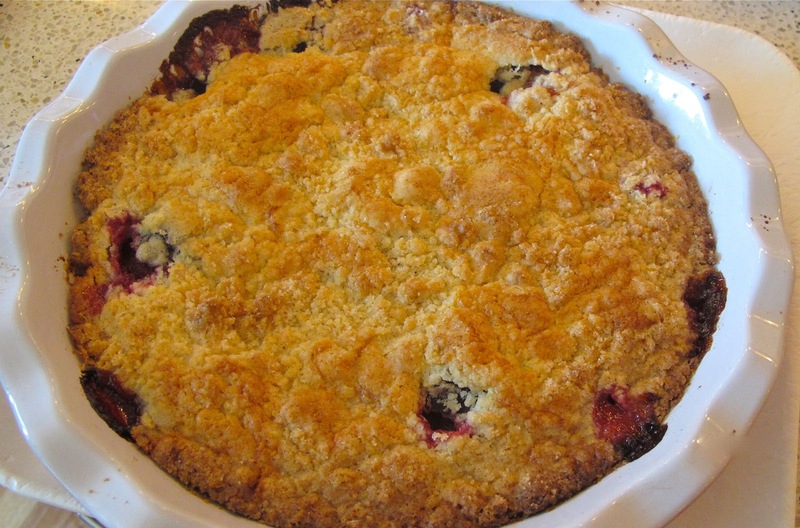 To make the fruit base, put the apples and blackberries in a large bowl and sprinkle with sugar. In a small dish, dissolve the cornstarch in the lemon juice. Pour over the fruit, add the dried cranberries and toss gently. 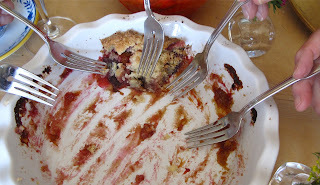 Pour the fruit mixture in a 9 inch square glass pan or alternately, individual ramekins. Place on a baking sheet covered in foil to catch overflowing juices. Top the fruit with 1/2 of topping mixture and bake for 20 minutes. Sprinkle the remaining topping over the crisp and bake another 20 minutes. Let cool.